Data recorder: Recording of operating data such as motor current, velocity, position or position error. Wave generator: Saves and outputs periodic motion profiles. 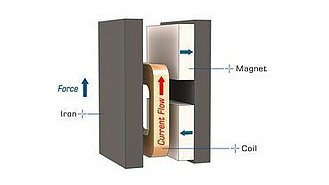 Autozero function defines the holding current, at which the drive outputs a force of 0 N in open-loop operation, e.g., for compensating the weight force. ID chip support: Detects the stages connected and simplifies configuration and exchangeability. Supports direction-sensing reference point switches. Extensive software support, e.g., for LabVIEW, dynamic libraries for Windows and Linux. Point-to-point motion. Data recorder. Wave generator. Autozero.ID chip detection. Point-to-point motion. Data recorder. Wave generator. Autozero. ID chip detection.